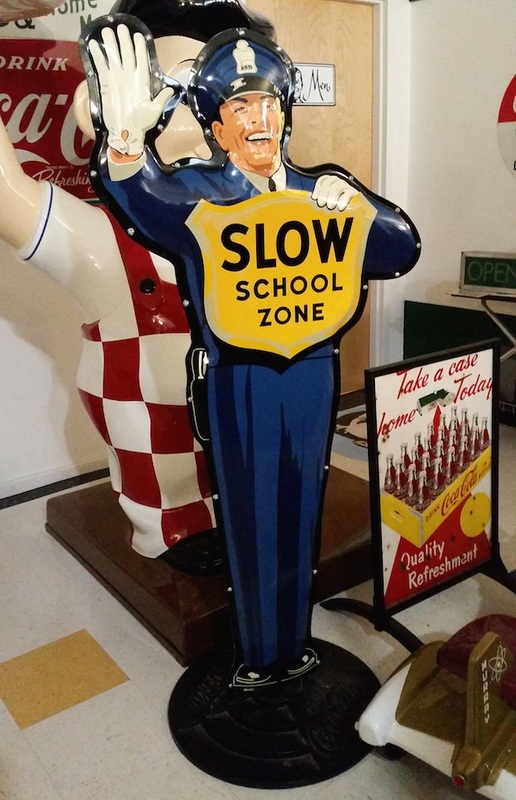 You might know him as the Coca-Cola Cop, the Coke Traffic Cop, or the Policeman Slow School Zone Sign. Whichever name you prefer, it’s the same vintage sign that’s one of the most sought-after Coke collectibles of all time—and an inspiration for one of our own decor products. 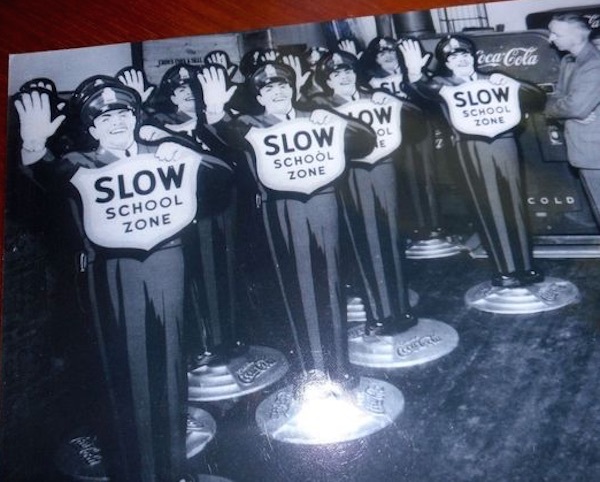 First produced in the 1950s, the Coke Cop sign depicted a smiling crossing guard with one hand raised and the other hand holding a yellow shield sign that reads “Slow School Zone.” A unique design to be sure, but perfect for its purpose. Schools all over the country set this sign out in the street to warn drivers to be alert for students, making it equal parts school safety equipment and marketing tool. Both sides featured details made with reflective material that would catch car headlights in case someone left the Coke Cop out in the street! A threaded pipe ran down the center of the sign between the metal sheets, which allowed it to be attached to a cast-iron pedestal base. This 22″ wide circular base was sold separately, featured an embossed “Drink Coca-Cola” slogan in red script, and was heavy enough to keep the sign in place. One final (and important) piece was the wheel assembly. This consisted of a pair of heavy-duty rubber wheels that could be bolted to the pedestal base. Without these wheels, people would have had to carry (or drag!) the Coke Cop around – no easy feat, given how heavy the base was. It can be hard to find a complete Coke Cop sign in good condition today, as the pedestal base was sold separately and the sign was meant to be used outdoors. 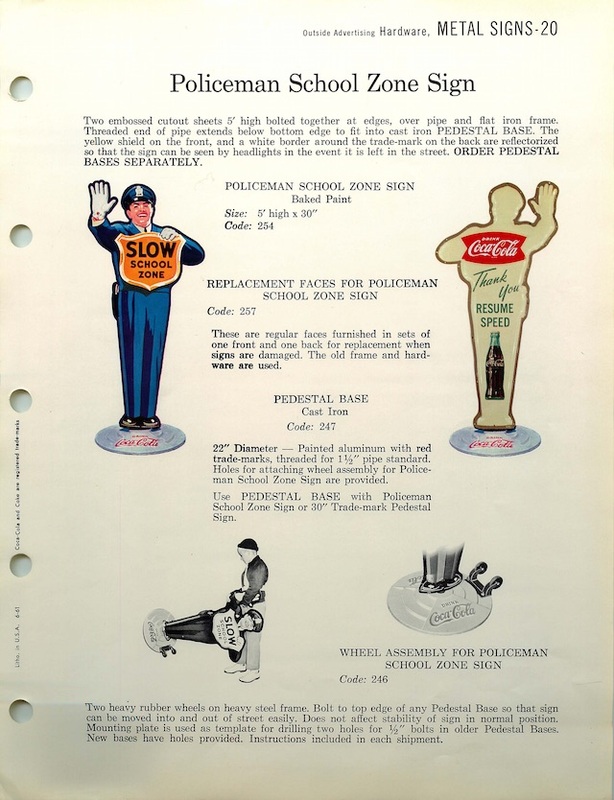 As a result, a vintage Coke Cop can fetch a lot of money on the collector market, in any condition. 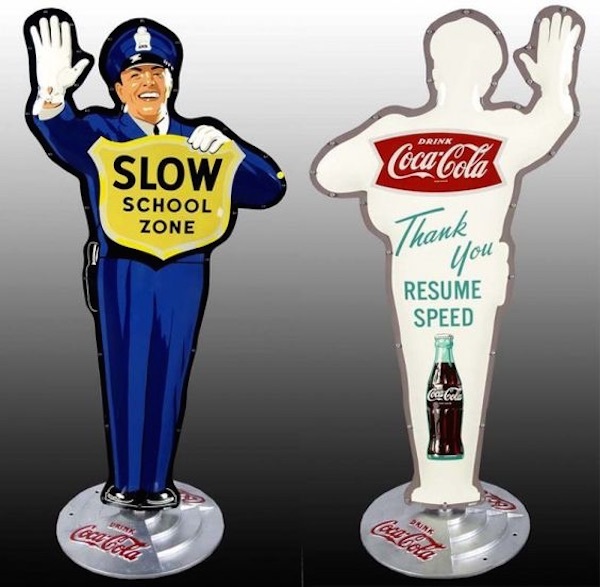 The Coca-Cola Cop Crossing Guard Large Metal Sign is made of two steel panels, is officially licensed by The Coca-Cola Company and is available exclusively at RetroPlanet.com. 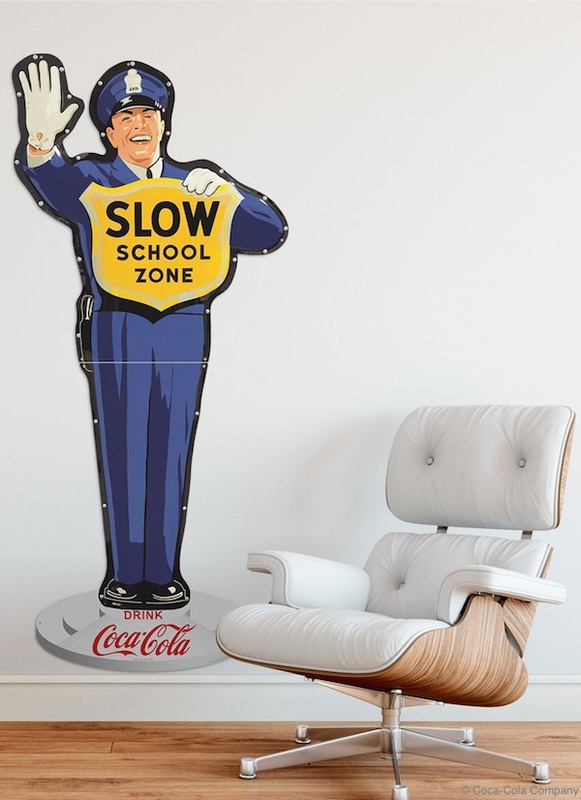 As an alternative to a vintage Coke Cop sign, we’re celebrating this famous piece of Coke of history with a wall decal version of the Coke Cop in three sizes (24″, 36″, and 48″). This peel-and-stick wall decal makes it easy to decorate in retro style and recapture heartwarming memories of a simpler time. Like all our Coke wall decals, it’s printed on polyester fabric, officially licensed, and made in the USA. We think our Coke Cop wall decal will look great in a retro kitchen, company lunch room, or restaurant; or in a bustling hallway in the office! 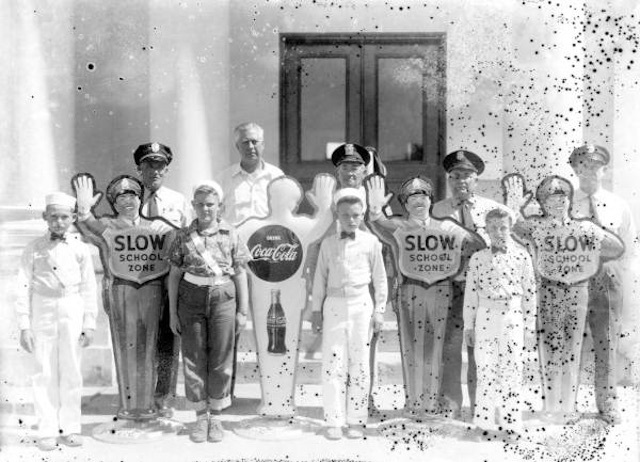 Do you have your own childhood memories of the Coke Cop? Please share below, we’d love to hear them! Ask Coca-Cola fans which is the greatest year in Coke history, and you’ll get all sorts of answers. Likely choices include 1886 when pharmacist John S. Pemberton created the fabulous drink; 1915, the year the contour bottle was created; or 1950 when Coke became the first product to appear on the cover of Time magazine.